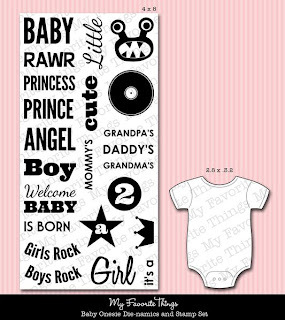 Up first is the Baby Onesie stamp and Die-namics. It's part of the family with the Girly Graphic Tee and the Masculine Graphic tee, only cute, and tiny. The die features lines that both cut and emboss for details at the sleeves, collar and the little diaper snaps... so sweet. The stamp set that coordinates is *huge* with tons of creative possibilities. Inspired by this sweet new patterned paper, I inked up "Little Princess." The sweet crown would have easily fit on the tiny tee too, but I loved putting it off to the side nestled inside a pair of Circle STAX. A tiny cluster of Fishtail Flags STAX peek out from the bottom of the main panel. I'm using my a*Muse studio inks for the stamping on here, I love the variety of colors, and the excellent coverage. Here's a peek at the stamp set and Die-namics. Really sweet right? 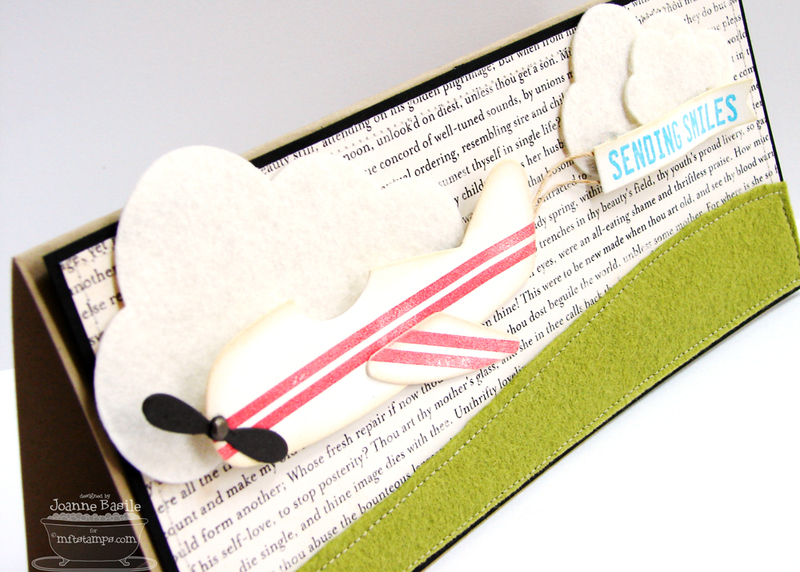 I also have a sample of the new Airplane Greetings Die-namics and Stamp Set, as well as the Jumbo Cloud STAX. Don't you think this set would make fun cards for boys? Or prettied up, would be a fun stamp set for a cheerful hello for a friend? I also envision this set as fabulous for new baby cards. While there is an element on the stamp set you can use to stamp the rope for the banner, I just attached mine with a bit of twine. I cut the propeller from grey card stock and attached with a small brad. Remember to stop by the MFT Blog today for a full list of designers with samples to share! Both cards are very nice! I love your work! Lovely cards. Love the soft hues on the first card. The 2nd one is so sweet. Love the felt grass and clouds. Joanne - your cards are gorgeous! I am excited about the onsie die and stamps and I love the felt you used on your airplane card! So textured and fun! 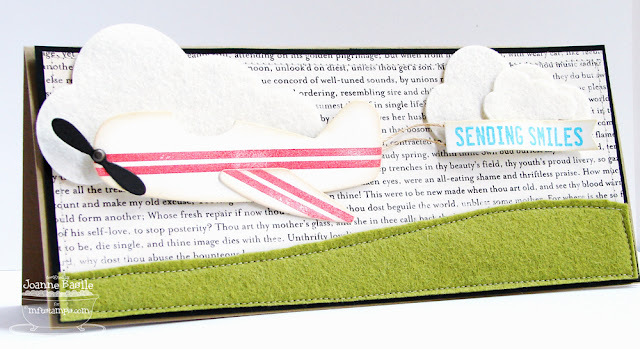 That little airplane has my heart fluttering with excitement.What fabulous little people cards will be made with this stamp and dienamics set. 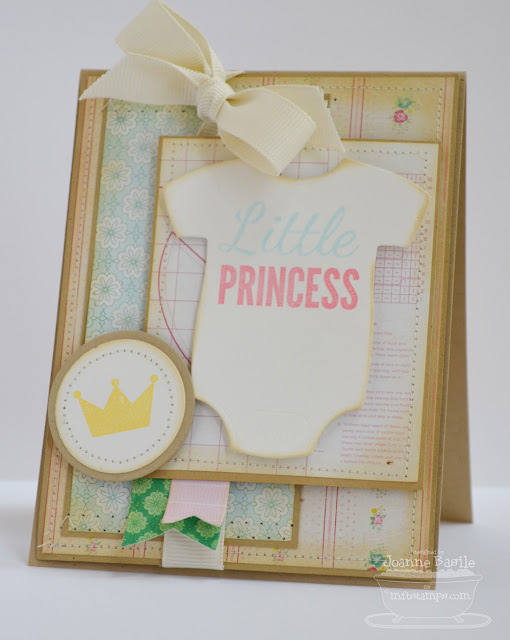 Love how you used light colors, adding all these stamps and dies to my wish list. I LOVE both of your cards, Joanne! I think I am going to have to have BOTH of these sets and dies!! Both cards are sweet!!!!! Love the fun flags poking out in your first card and the felt on your 2nd is just too cute!!!! Cute, cute! Love them both. Love both your cards, love the muted colors on the onesie card! The onesie set is just darling. I love the patterned paper you used and the crown accent. These two new sets are awesome and I love your cards Joanne!! Amazing! Great cards. Love the softness of the first card. Love the new dies and stamp sets. Love the little girl card Jo...soooooo pretty! And the felt grass on your airplane card is awesome! LOVE!! oh SO CUTE!!! love them both! such a FUN airplane!!! Can NOT wait until I can get the plane set. Love your cards! Love the crads. the baby one is so soft and cute. and the plane very cool. I love both cards! The airplane card is so unique! Both of your cards are wonderful. I like the way you used felt on the second. Both of these rock honey!